The therapeutic applications of cupping have been documented through several thousand years of clinical experience. By creating suction and negative pressure, cupping is used to drain excess fluids and toxins, loosen adhesions and lift connective tissue, and bring blood flow to stagnant muscles and skin. Today, varied techniques using moving glass cups greatly enhance many spa/body treatments and massage modalities. This ancient method has been adapted for modern use and intensifies the therapeutic aspects of current treatments. How is cupping accomplished? A cotton ball is clamped in hemostats and soaked with about five to ten drops of alcohol. The cotton is lit then inserted into the glass cup to create the vacuum. The therapist moves the cup over the area to be treated, removes the cotton ball and inverts the cup onto the body. If using a manual vacuum set, the cup is placed on the body and the pump is activated to remove the air. There are two main techniques of cupping: stationary and moving “massage” cups. Stationary cups are placed on the skin and left for a period of five to fifteen minutes. Four to six cups may be applied and then removed cyclically in a technique called “flash cupping.” These methods are used most commonly in Chinese Medicine. Stationary cupping is often used on both adults and children in the home to relieve cough and colds, along with certain asthmatic conditions. In Europe, cups are frequently found on pharmacy shelves, and in home medicine cabinets for family use. 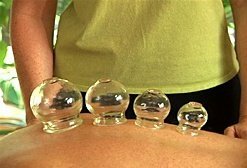 Many people have memories of a grandmother who still practiced cupping. The other technique is moving cups, or “massage cups.” This is the more common use for massage therapists and other healthcare practitioners. Before applying the cup, the therapist administers plenty of oil to facilitate smooth movement. When applying oil, they palpate the tissue to discover the areas of tension and congestion; create the vacuum and place the cup. The entire back may be treated, including the neck, shoulders, middle and lower back, and sacral area. The hip, thigh and abdominal areas may also be treated. People often describe a deep warmth and a tingling sensation long after the treatment has ended. Cupping is not an irritant to the skin or body. It draws the inflammation out, yet does not add to it. This technique is excellent when used as a contrast therapy with cold compresses or liniments. A favorite use of the cups is on the broad area of the back. This is wonderfully effective as an addition to a massage. The action on the nervous system is sedating, and people will often descend into a profound state of relaxation. Larger cups are used on the back, and a strong vacuum will mimic the rolling action of deep tissue massage without the discomfort. The movement may be long and draining or circular and stimulating for stubborn knots and areas of rigid tissue. The skin will turn red with strong cupping, indicating that the circulation has been brought to the surface. Application of liniments, analgesics, plant hydrosols, and essential oil blends immediately after the cupping will enable the absorption of the product deep into the tissue. The increased local blood supply to the muscles and skin will bring nourishment and allow for toxins to be carried away via the veins.